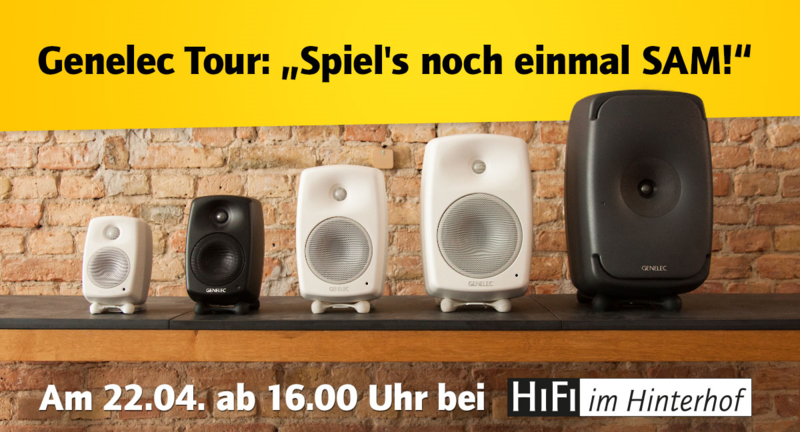 Yet another event for April: On Friday 22nd April 2016 Marcel Schechter from Audio Export and Tomi Hassinen Genelec will be presenting us with the latest SAM models of Finnish active speaker specialists and will be demonstrating the potential for calibration- and optimization of the home system GLM. This Friday the Genelec loudspeakers 8320, 8330 and 8351 and probably the 7350 subwoofer, so both classical stereo and Advanced 2.1, will take the spotlight. All models are SAM series (Smart Active Monitoring), meanibng they can be adapted on the network-based GLM (Genelec Loudspeaker Management) to the individual spatial condition. Part of the GLM-system, apart from the speakers themselves, a special measurement microphone, the user-friendly GLM 2.0 software (for Windows and Mac) and the GLM network adapter with each other ensures the communication of all components. Of course, it will not just be theoretical introduction in Genelec’s system. Using numerous musical examples, the different speaker setups and configurations will be illustrated. Since it is comprised of exclusively active speakers, the chain will also consist of MacBook and Hegel DAC. The presentation will begin at 4pm. Prior registration not required!